Most companies starting out can usually track, and manage, their operations in spreadsheets and off the shelf accounting packages. As they grow, they typically add specialized applications as needed and when budgets permit, all while continuing to work in spreadsheets. This works for a short time, until the company starts growing and realizes the manual effort, and cost, involved in tracking day-to-day financial and operational information. 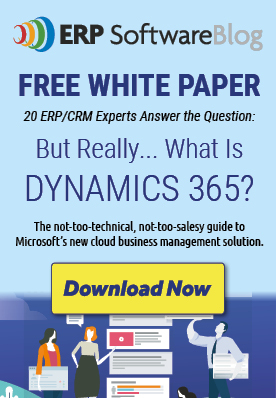 At some point, senior management realizes the organization needs an end-to end ERP system. This decision can be based on production needs, but the lack of financial visibility in the company tends to be the key driver in buying an ERP system. If your business is experiencing these symptoms it may be time to consider making a change. Visit our website here to download the full guide with more information that can help you determine if you're ready to make the switch from an entry-level accounting package to a modern ERP solution.